Wallingford Carnival is an annual event that takes place around the town centre through to the Kinecroft. The Carnival has been running for over 50 years and takes place on the third Saturday of June. Wallingford Carnival depends entirely on volunteers, both on the day and for the whole year before each event. We receive no official funding - all the money needed to provide the entertainment, music, first aid cover, toilets and the necessary costly insurance cover comes from raffle ticket sales and the generosity of local sponsors. Each year the Wallingford Carnival Committee invites local charities and organisations to apply for the bucket collection which takes place during the procession and this gives them an opportunity to raise funds in excess of £1,000. The Carnival Committee work hard throughout the year to ensure that the Carnival continues to be a spectacular all day event which involves many parts of the town and as many people as possible. From stalls to bands during the day, the procession through the town in the afternoon right through to music until the evening - the Carnival provides fun and entertainment for the whole town and is always popular with the residents of Wallingford and visitors. Below is a map displaying the route that the procession will take. 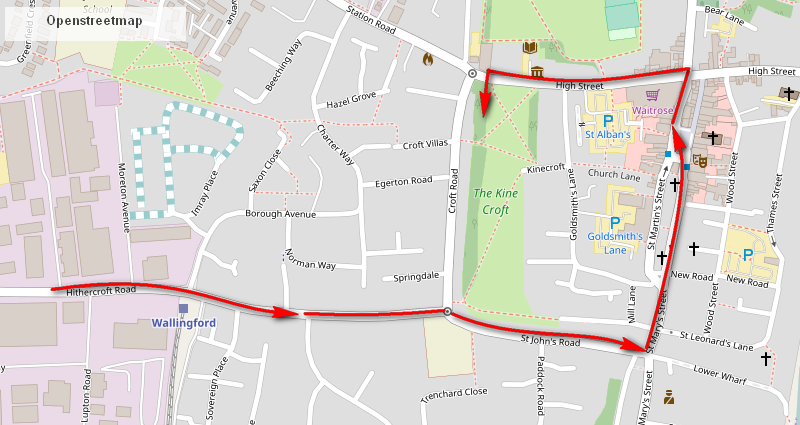 The Carnival Procession leaves Rockfort Estate, Hithercroft Road and heads along Hithercroft Road, St. John's Road and on through the Town via The Market Place, the High Street and onto The Kinecroft.